John Sullivan Dwight (May 13, 1813 – September 5, 1893) was a Unitarian minister, transcendentalist, and America's first influential classical music critic. Dwight was born in Boston, Massachusetts, the son of John Dwight, M.D. (1773–1852), and Mary Corey. He was a member of the New England Dwight family through his paternal grandfather, John Dwight, Jr. (1740–1816). He graduated from Harvard College in 1832 and then prepared for the Unitarian ministry at Harvard Divinity School, from which he graduated in 1836. Dwight was ordained a minister in 1840, but ministry proved not to be his vocation. Instead he developed a deep interest in music, in particular that of Ludwig van Beethoven. Dwight served as director of the school at the Brook Farm commune, where he also taught music and organised musical and theatrical events. About this time he began writing a regular column on music. Brook Farm collapsed financially in 1847, but Dwight set up a cooperative house in Boston and began a career in musical journalism. He married singer Mary Bullard (daughter of Silas Bullar and Mary Ann Barrett) on February 11, 1851. In 1852, he founded Dwight's Journal of Music, which became one of the most respected and influential such periodicals in the country in the mid-19th century. Among the early writers was Alexander Wheelock Thayer, who would become one of the first major music historians in the country. Other contributors included John Knowles Paine, William F. Apthorp, W. S. B. Mathews and C. H. Brittan. In 1855, Dwight translated the carol "O Holy Night" from the French. Together with his friend and colleague Otto Dresel, who emigrated from Leipzig in 1848 and settled in Boston in 1852, the two "contributed singly and jointly to the shaping of American taste for the European classical tradition in music". In his criticism of the contemporary American pianist Louis Moreau Gottschalk, Dwight stepped into a trap. At a concert, Gottschalk claimed a Beethoven work as his own and identified one of his own as a Beethoven. When a hostile Dwight praised the wrong piece, the composer sent a note apologizing for the "printer’s error" in the program, but wryly thanking him for the praise. His wife died September 6, 1860; they had no children. He died on September 5, 1893, and is buried at Forest Hills Cemetery in Boston. ^ a b Benjamin Woodbridge Dwight (1874). The history of the descendants of John Dwight, of Dedham, Mass. 2. J. F. Trow & son, printers and bookbinders. pp. 1012–1013. ^ Richard Kitson (1991). "Dwight's Journal of Music" (PDF). Retrospective Index to Musical Periodicals. Retrieved February 3, 2011. ^ Introduction, p. ix, Otto Dresel, Collected Vocal Music, ed. 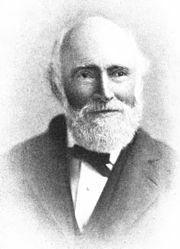 David Francis Urrows. Middleton, Wisconsin: A-R Editions, Recent Researches in American Music, v. 45, 2002. ^ Peter Andrews (1982). "American Heritage, Volume 34, Issue 1" (PDF). Chopin called him "THE KING OF PIANISTS". Retrieved November 21, 2012. George Willis Cooke (1898). John Sullivan Dwight: Brook-Farmer, Editor, and Critic of Music; A Biography. Boston: Small, Maynard & Company. Horowitz, Joseph. Classical Music in America: A History of Its Rise and Fall. New York: W.W. Norton, 2005. Robinson, David. "John Sullivan Dwight". Dictionary of Unitarian and Universalist Biography. Unitarian Universalist Historical Society. Retrieved 2008-08-07. This page was last edited on 17 January 2019, at 14:47 (UTC).